The “Matryoshka”, or as it is also called the phantom, is a simulator of the human body, and for more than 10 years now, has been collecting data on cosmic radiation. The obtained findings helped to create a list of recommendations for cosmonauts. In March, the Matryoshka’s detectors will be updated. Radiation permeates all space, and its devastating impact is a key problem that will be encountered by cosmonauts during the long manned mission to Mars. “The background radiation in the universe is much stronger than on Earth. During six months in orbit, a cosmonaut obtains a dose of radiation that a normal person on earth obtains over 100 years,” says Vyacheslav Shurshakov, head of radiation safety of space flights at the Institute of Biomedical Problems, Russian Academy of Sciences. Each astronaut on the ISS carries a personal dosimeter in only one place – in the chest pocket, and this gives a general picture of radiation exposure. To thoroughly understand the irradiation waiting for the space traveler, Russian scientists sent to the ISS a phantom simulating the human body – the “Matryoshka”. It was created in 2004 by the Atomenergomash Company, a member of the Rosatom State Corporation. In its composition, this device comes closest to imitating human tissues – the same content of nitrogen, oxygen, hydrogen, and carbon. 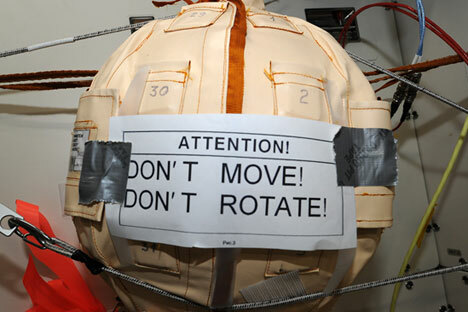 Inside the spherical phantom are mounted detectors (about 500 sensors) located in places of the critical organs. “This round form was found to be the most optimal. It allows us to maintain the depth of the organs in a human,” notes Vyacheslav Shurshakov. After a while, these detectors are removed and sent back to Earth, and the new ones are sent to replace them. The next replacement is scheduled for this March, when a new crew is sent to the ISS. Prior to 2004, only localised studies were being carried out. The Americans studied the distribution of the radiation dose in a phantom head. At the Russian space stations Salyut and Mir, experiments were conducted using spherical phantoms filled with water. Curious results were achieved by the Russian Manikin’s flight around the moon on the spacecraft Zond 5. He was very similar to a human, though he was made from wheat. Sensitive sensors of the phantom constantly accumulate detailed information about radiation. In fact, the “Matryoshka” is already protecting the health of people. “Recommendations have been made for cosmonauts as to which compartments of the space station are better during a period of solar activity, which side to turn towards the sun, that is, how best to avoid receiving a critical dose of radiation,” said Vyacheslav Ivanovich Petrov, chief electronics specialist at the methods and instruments for radiation detection department of SNIIP OJSC (part of Atomenergomash). Rosatom was the first to build such a device, and even provided for the use in its phantom of detectors from other countries. Many countries are trying to build a similar research complex. In Europe, the phantom “Randy” is being developed in the shape of a human torso. He has also been on the ISS, and even spent a year in open space. However, a few years ago, he was returned to Earth for further development. Now a large international project is underway to create a phantom, which is very similar to a human body, it will even have bones. The idea is the same: radiation detectors are mounted in the locations of critical organs.